Size of Male: 50 lbs, 19-21 in. Size of Female: 40 lbs, 18-20 in. 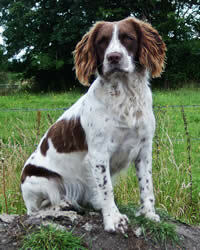 The English Springer Spaniel is a wonderful addition to a family that likes action-packed adventure. The breed is highly energetic, trainable and attached to its human family. If your schedule involves jogging, a hunting trip or a fun-filled game of tag in your backyard, you can be assured that your furry friend is in sync with you. Before the 1800s, the breed used to belong to one big Spaniel family in England. The smaller-sized members became eventually known as “cockers” because they hunted woodcock. Meanwhile, the larger-sized members assumed the label “springers” because they were adept at springing or flushing game. It was in the early 1900s that English Springer Spaniels became a recognized breed, distinct from its littermates, the English Cocker Spaniels. Sweet, clingy, trusting, smart and athletic are words that best describe the breed. For the most part, there are two things that will make or break its temperament: attention and activity. People with busy schedules should think twice about getting one of these dogs for a pet. Lack of attention and exercise often causes the breed to suffer from separation anxiety. It’s not unusual to find a lonely and restless Springer engaged in destructive chewing and defensive biting. Some of them develop a personality disorder and may suddenly become vicious. Living Environment – Homes with ample yard space are best for this inquisitive and alert breed. If you are living in an apartment, the pet can manage, provided you take it out for regular walks. It is recommended that you keep your place sanitary and uncluttered. The dog could easily mistake any stray socks, bottles and plastic objects as toys. Grooming – The breed tends to shed hair on both daily and seasonal bases, and will develop matted hair if left unmanaged. A brushing session once every 2 or 3 days should fix the problem. In addition, you must find time to check its ears for possible infections and have it trimmed every 3 months. Diet & Exercise – This medium sized dog breed is prone to rapid weight gain. In general, servings that are 75 percent meat or poultry and 25 percent fruits and vegetables are ideal. Vitamin supplements are not required and may even cause harm. There are also some Springers who develop allergies and will need customized diets. The breed requires regular exercise to stay happy and well behaved. You must be able to engage the dog physically and mentally on a daily basis. The last thing you want in your home is a lonely, bored and destructive dog. Health – Despite its boundless stamina, the English Springer Spaniel may be afflicted with a number of dog health problems such as ear infections, skin allergies, epilepsy, canine hip dysplasia and elbow dysplasia, and progressive renal atrophy (PRA). It is always wise to keep a close eye on your pet’s diet and overall well-being. The English Springer Spaniel is a smart and malleable breed. To curb its chewing and biting tendencies, however, not much training is needed but an outlet for the dog to disperse energy. These dogs excel in hunting, tracking and retrieving and also enjoy fly-ball games, swimming and obedience training courses. Versatile among dog breeds, Springers will appeal to several types of pet owners: those who require therapy, those who need hunting companions and those who simply want the undivided attention of a furry friend.